Almost half the municipal securities outstanding today are fixed-rate, unrefunded, and callable by the issuer prior to maturity. The timing of an issuer’s refunding decision for these callable bonds drives interest rate risk and cash flow timing, credit risk, and even the realization of potential tax events. And yet, standard “OAS” approaches fail to capture the multi-market nuances of a municipal issuer’s refunding decision. 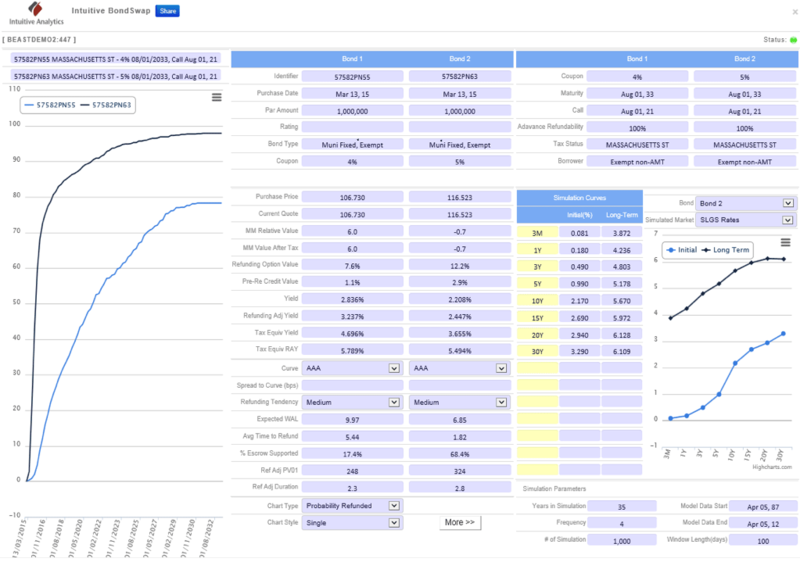 SmartModels™ BondSwap captures these complexities and more, with path-breaking new analytics that handle the multi-market modeling essential to understanding refundings and muni callables. BondSwap even automatically estimates the advance refundable status of muni callables, and applies current tax laws to potential future refunding activity. In this way, BondSwap provides a comprehensive view of the relative value inherent in municipal bond prices. Investor Refunding Adjusted Yield (RAY) – Expected yield given issuer’s refunding behavior. Refunding Adjusted Kick – RAY minus Yield to Call. % Escrow Supported – Percent of cash flows expected to be risk-free. Make better buy/sell decisions in managing a muni portfolio. More accurate reflection of interest rate, credit and tax risks. Secure online application available anywhere there’s an internet connection, anytime. New features added continuously and updated in real-time.